The range of aromatic compounds seems limitless. 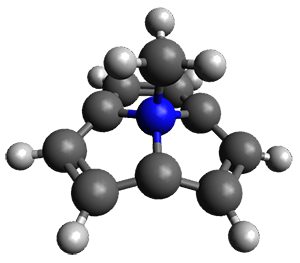 Mascal and co-workers have prepared the azatriquinacene 1 in a remarkably simple fashion.1 The molecule is a zwitterion, with the carbon atoms forming a 9-center, but 10 π-electron ring, and the quaternary nitrogen sitting above it. The carbon ring satisfies Hückel’s rule (4n+2) and so should be aromatic. The capping nitrogen should help to keep the carbon ring fixed in a shallow bowl. As expected, the molecule in fact turns out to possess an aromatic 10 π-electron ring. The B3LYP/6-311++G(d,p) geometry is shown in Figure 1. There is little bond alternation among the C-C distances: the mean deviation is only 0.015 Å with the largest difference only 0.024 &Aring. The x-ray crystal structure shows the same trends. The NICS(1) value is -12.31 ppm, larger even than that of benzene (-10.22 ppm). Figure 1. B3LYP/6-311++G(d,p) geometry of 1. 1) Hafezi, N.; Shewa, W. T.; Fettinger, J. C.; Mascal, M., "A Zwitterionic, 10 π Aromatic Hemisphere." Angew. Chem. Int. Ed. 2017, 56, 14141-14144, DOI: 10.1002/anie.201708521.